Time For Auto-Pilot | Mediterra - Swim & Run Better Than Ever! I am continuing some more with thoughts related to the previous post Thinking Or Feeling? If you already agree that mindful practice, deep concentration on feeling with the nervous system is a good way to ensure quality during practice time, the question may come up – should this be the perpetual state of swimming then? Always deeply tuned in? Actually, no. This is the other side of the mindful coin. You train every stroke detail mindfully so that, after sufficient training, you don’t have to mind them. You train mindfully so that precise movement patterns are memorized. You burned these patterns in deeply under more challenging practice conditions so that they are resilient under more stressful race conditions. And when these patterns are memorized by the brain, your brain is now in position to run those patterns on auto-pilot while your conscious attention turns to other matters of your choosing. Why do martial artists, emergency personnel and musicians train relentlessly for perfection of the patterns? So that, under the pressure of a conflict, crisis, or in a concert in front of thousands, they can trigger the program, let go and let the body ride it, letting their minds move into a higher state. This resilient programming is what you absolutely need in place when you have a serious race. Or, a great challenge ahead. Or when you head out on a total pleasure swim. Or, in my case, when I feel inspiration to sketch out a new blog post in the middle of my swim. Or, to pay attention to the swimmers I am guiding along in the sea. I don’t want the stroke falling apart or pace deteriorate because my attention goes elsewhere. The stroke will stay in it’s rhythm and pace IF I’ve trained it to stay there through such mindfulness. 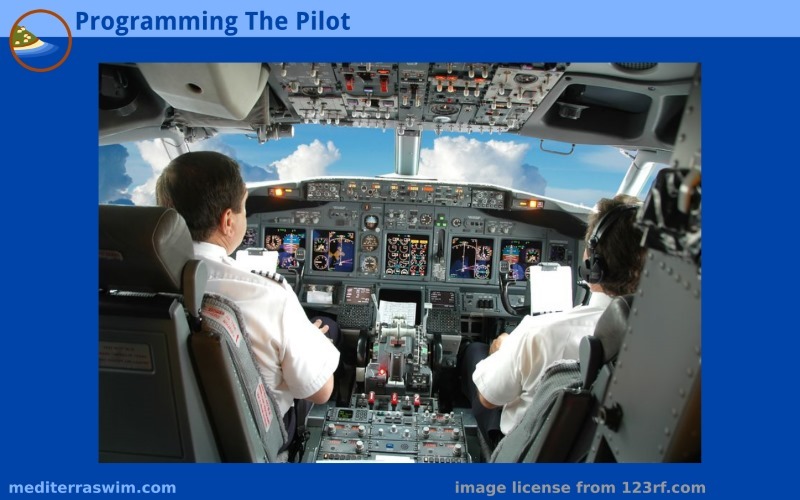 Let’s use this analogy of ‘auto-pilot’ and, specifically, the word ‘pilot’ a bit more. In the movies there might be a scene where someone switches on the auto-pilot and then leaves the cockpit to go deal with a bad guy in the back of the plane. But, in real life (I sincerely hope) the pilot of my flight does not leave the chair, and does not completely turn off attention from the control panel. She might be sipping coffee and chatting with her co-pilot, but she remains in charge and ready to respond to the slightest abnormality in the flight. One side of the brain may be chatting, but the other side is monitoring the situation – her whole nervous system, below conscious level is tuned into the feel and signals coming from that vessel, as if it were part of her own body. Your auto-pilot capabilities are only as good as the training you’ve done to program them. And, it only works reliably under the conditions you’ve trained in. If you need that auto-pilot to hold up under longer, faster, deeper, darker, wavier, more lonely swimming conditions, then you had better train for it in those conditions. The more challenging the conditions, the more difficult it will be to swim smoothly on auto-pilot. When things get shaky, the pilot needs to click off the auto-pilot and take over manual control until things are smooth again. The pilot who has learned each system intimately, who has taken the mindful time to master the skills of correction, can quickly scan those systems to find problem spots and apply the the programs to fix them. In this analogy the pilot of the plane represents your conscious mind which is piloting a vessel = your body. During practice you train in all the little details of flying your vessel smoothly so that you don’t have to keep your conscious mind on all those little details during the big swim. They are taken care of by the programs you’ve hard-wired into place. Because of these programs keeping the vessel smooth, your conscious mind can be free to focus on other things – hopefully, higher order matters, more productive, more positive subjects – while the basic, efficienty stroke is taken care of by the subconscious brain. There is so much on the line in an airplane that we hope no pilot ever switches off attention, even while things are working perfectly on auto-pilot. But, for us in the water, especially for most in swimming pools, there is very little at stake other than one’s own pleasure and satisfaction. Yet, top performance in world championship races, survival in very serious open water, and our own humble personal records depend on so many little details being programmed thoroughly. There are stages to this programming which I have mentioned before in Deep Practice Encouragement series of posts. I highlighted some points made by Joshua Foer, who was in turn summarizing points made by Anders Ericsson, the leading expert on the Science of Expertise. In developing expert skill there is the Cognitive Stage, the Associative Stage and the Autonomous Stage of performance (please refer to that post for definition of those, and links to those authors). We go through these stages in order to create an auto-pilot mode for a certain stroke pattern that can be available to us when we want it – for that race or pleasure swim. But this is the very important point: in auto-pilot mode, those skills that are automated are working for you, but they are not getting better by any amount of repetition. Only when you step back into Associative Stage (Programming mode = “paying close attention”) do you resume the kind of work that will actually improve the skill. When some people urge you to ‘Don’t think so much!” what they should mean by it is ‘get out of the Cognitive Stage’ – because that stage has limited value to actually making you swim better – yeah, plan your moves, but then, ‘get moving!’ When I say, “Be mindful!” it means that you should get into the Associative Stage. What this post is pointing out is that there is a time to get into the Autonomous Stage and enjoy it! It has a purpose. So, you have both stages available to you – Associative (Programming Mode – Improving) and you have Autonomous (Auto-pilot Mode – Not-Improving). You should spend time in each, knowing what each does for you and what they don’t do for you. Perhaps you are content with the level of skill you have for the conditions you intend to swim in. Then, by all means, go swim on auto-pilot! Enjoy! This summer, five of my TI Coach colleagues will separately complete their English Channel swims [at the time of writing 3 have completed and two more are scheduled to go within a couple weeks] – they have had to stop their training at some point and just go swim that channel. They could wait longer and get a bit better, but at some point its time to just go. Perhaps you are not content with the level of skill you have for the goal you are training for. You should still go out and occasionally enjoy auto-pilot mode with what you’ve got already. Improvement is a lengthy process and enjoyment must be built into that process so you can keep going. You derive some portion of enjoyment from how you set up your practices to make improvement a regular experience, and you derive another portion of enjoyment from just going out to use the skill you’ve got on hand. There is a personal balance to strike between those. And, what is your practice time actually for? Improving or not-improving? You want to get better but that comes in cycles that involve rest. If you need a rest for the brain, just as you need a rest for the body, then take it – swim in a different mode. But practice is for improvement. Not only is auto-pilot in practice putting you in the ‘not-improving’ mode, it is BORING… unless you are actually not-practicing, but rather going for a pleasure swim during that time. Pleasure-swimming is OK too, but recognize what mode you’re in and what you may expect to get out of it. Perhaps you need to include pure-pleasure swimming as part of practice, because such rest is necessary part of improvement and maintaining motivation! So, how much of each should you use? That is totally up to you. I think it is a matter of person, a matter of discipline, and a matter of season. Matter Of Person – Some people are set up for more or less deep concentration. But this is not a fixed ability. As long as the brain is plastic, attention span and depth can be expanded with training. Matter Of Discipline – There are achievement goals with deadlines that simply require you to work with great concentration when you don’t feel like it. I’ve got a TI swimmer friend doing the 10-mile Lake Windemere swim (for the second year) this week and he simply cannot mess around when preparing for that swim. Matter Of Season – And, there are seasons in the year and over the years when you just feel the signals of your body and mind urging you to emphasize one mode over the other. Recognize what kind of person you are. Acknowledge the training requirements of your goal. And mind the signals your body sends to point you in the healthiest way to go forward.